The entrance to the Highland County Community Action Organization Inc. offices in Hillsboro is shown. A community agency in the county is turning 50 this year and has a lot more to offer the people of Highland County than perhaps what is known. 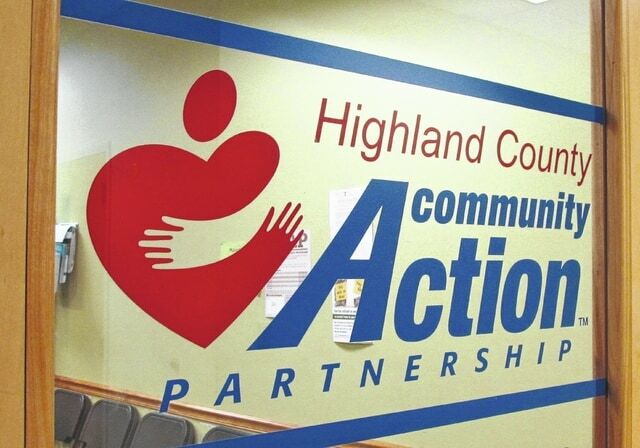 The Highland County Community Action Organization Inc. began in November 1965 and operates a number programs to benefit people in the community. Contrary to what may be believe, the agency is a private non-profit organization, not a county, state, or federal entity. “Helping People. Changing Lives.” are the words people are met with as they enter through the doors to the lobby area of the agency at the North High Business Center in Hillsboro. Those words are what the agency is all about, according to executive director Julia Wise, who has been with Community Action for 27 years. The agency is governed by a board, which has representatives from the private and public sectors, as well as the low-income sector of the county. The board meets on the fourth Tuesday of each month at 6 p.m. at the Hillsboro office, and the public is welcome to attend. There are more than 1,000 Community Action agencies across the country, Wise said. They were created through 1964’s Economic Opportunity Act, enacted to combat poverty in communities across the nation. While Wise said each agency is different, they are all geared toward the communities they serve. In Highland County, there are programs in Family Health Services that include WIC, breastfeeding classes, family planning, a program to help pregnant mothers stop smoking, a car seat program, help with finding medical coverage, and more. Emergency Services programs include utility assistance, an emergency food pantry, financial counseling, and transportation. Housing programs include weatherization, Community Housing Improvement Program, and programs through local utility companies to help residents with needs in the home insofar as furnaces and refrigerators. Highland Heights in Hillsboro and Sycamore Glen in Greenfield are residential areas operated by Community Action. The agency headed up the Moving Ohio Forward Program for the couple of years the state awarded money to Highland County to demolish blighted properties across the county. The agency has a Head Start program, which Wise said was one of the primary programs when HCCAO began nearly a half century ago. There are classes in Hillsboro and Greenfield. At the agency’s Greenfield office, health and emergency services are available. Greenfield is also the location of the kitchen where all the home-delivery meals are made. The congregate meal site, were seniors can gather for a meal, is also located in Greenfield. HCCAO provides meals to senior citizens throughout the week as well. It also heads up the summer feeding program, which provides lunches to kids through the week during the summer, along with a weekend backpack of meals for them. That program will be operating in Greenfield starting June 8. In January, Community Action took over Ohio Means Jobs, Wise said, and the agency is working to implement changes there to further assist job seekers in their search for employment. Additionally, Wise said, the agency is able to refer those who are unemployed to services within the agency that may help them further. And for what the agency does, like with purchasing food and utilizing contractors, local is always sought first, Wise said. “Our goal is to support as much as we can locally,” Wise said. Wise said not everyone is aware of all the programs the agency offers. Anyone wanting to know can go to the website or contact the office. She said that every program operated has different income guidelines, but that many more people are eligible for programs than what is realized. Wise said a celebration is being planned for the agency turning 50 for October or November. More information will be available as the time draws nearer. For more information about the agency call 937-393-3458. Information is also available on the agency’s website at hccao.org. Highland County Community Action Organization is located in the North High Business Center at 1487 N. High St., Suite 500, Hillsboro.